Fear is one of humankind’s most primeval emotions and one that we have little control over once activated. Preying on that unconscious fear, the very concept of a ‘mindless eating machine, without passion or logic, hell-bent on attacking and devouring anything’ sparks even the narrowest of imaginations. Sharks have indeed been on the Earth for hundreds of millions of years, roaming their ocean habitat far longer than homo sapiens even dipped its toes in but that’s where the truth of the film’s advertisement and indeed its entire premise sadly ends. ‘Jaws’ is a fantastic piece of fiction. In spite of Peter Benchley’s (and indeed many others) later and tireless efforts to re-educate a misinformed global public about sharks’ true nature, including British-based shark and marine conservation charity, BiteBack, the ‘mindless killer’ image of sharks and especially Great Whites (Carcharodon carcharias) continues to be upheld by media across the world. 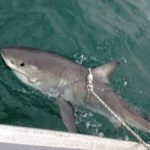 Shark sightings or encounters typically make local news and in the age of the internet, such stories flit around the globe in minutes. Creatures that are far more evolved than us should engender wonder and respect. However, reporting – more often than not covering ‘fearsome beasts lunging at boats’, ‘beach bloodbaths’, ‘targeting’ of swimmers and other such fear-mongering hyperbole – is on the increase twisting facts into dangerous fiction. We are not on the list of their preferred food – nutrient-rich pinnipeds, turtles, fish, other sharks, whales and carrion are much more so – but the ‘humans as lunch’ media agenda continues unabated. Any shark expert will tell you, sharks typically interact with surfers in a case of mistaken identity. Silhouettes of people on surfboards look very similar to those of the seals Great Whites in particular prefer to attack from below, camouflaged in the depths before rushing to the surface at speed to surprise their target. Combine a tonne of prehistoric muscle and cartilage with sharp, serrated teeth intent on killing or maiming with one 4,000 pounds-per-square-inch bite, is it any wonder a human on a board is likely to come off badly from any such encounter? Shark ‘attack’ survivors are often interviewed with their surfboard clearly showing bite marks, indicating the board – the seal in the shark’s mind – was the intended target and not the surfer looking to catch a break. When I had the chance to fulfil a childhood dream to dive with Great Whites, at Dyer Island off Gaansbai in South Africa back in 2003, I saw no maniacal, bloodthirsty aggression. I experienced just inquisitive, even timid and unsure creatures, curious about the caged and wet-suited invaders to their world. According to the International Shark Attack File, the world authority on incidences of human/shark encounters, 2017 was an ‘average’ year for unprovoked shark attacks with 88 reported, of which six were fatal. Did you know that forty times more people (c.250) die every year taking pictures of themselves in precarious situations? 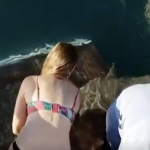 Your life is seemingly far more likely to end seeking that perfect shot for Instagram, than through any interaction with Mother Nature’s arguably most evolved creation. On the flipside, if we look at the global peril sharks currently face, humans kill between 70 and 100 million sharks every year for their fins, slicing them off and leaving the still living sharks to sink to the bottom to their death. If the media are guilty of demonising sharks, then blame must also be laid at the film industry’s door. Worryingly, in recent years, Hollywood has once again picked up the tired and out-dated ‘Sharksploitation’ mantle of ‘sharks as mindless killers’ and put the ocean’s apex predators back into its crosshairs. Anyone who has had the misfortune to watch any of the ‘Sharknado’ films, about tornados full of ‘bloodthirsty’ sharks making landfall on an unsuspecting town, can see how sharks have been reduced to cannon fodder in the role of the ‘baddie’, destined to be destroyed in a variety of ever more creatively gory and frankly absurd ways; chainsaws? Really..?! Whilst some will argue that the premise of these films is obviously based on ridiculous fantasy, the underlying detrimental impact of a ‘sharks are evil, they must be destroyed’ message must not be ignored, especially among the younger generations, who are un-brainwashed by Jaws. I would encourage any reader to put ‘Ocean Ramsey’ or ‘Andre Hartman’ into their search engines to see the real nature of Great Whites and understand how utterly false the ignorant premise of ‘mindless killers’ really is. 2006’s ‘Sharkwater’, a multi-award winning film by Rob Stewart also shows how misunderstood sharks have been and the threats they currently face. At the top of their food chains as apex predators, sharks help to create a balance in the natural marine order and serve as an indicator of its healthy condition. 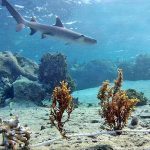 Sharks help remove the weak and the sick and manage population proportions in their individual ecosystems. 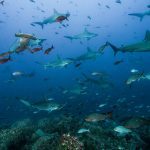 If there are no longer sharks in the seas, to maintain the health of the food chain and regulate diversity, the oceans are more likely to self-destruct, which will in turn have long-reaching negative effects on mankind. Much as media played a role in turning the world against the lions of the sea, the opportunity to use their influence now as a force for good is one that must be taken. I implore journalists and editors alike to scratch ‘shark attack’ hyperbole from their lexicons and much like the international press coverage Save the Rhino, Tusk, Save Tigers Now and other endangered quadrupeds receive, to put the plight of sharks on the front page. If it truly is ‘all psychological’, as I firmly believe, minds can and must be changed before it’s too late. The power to do so rests firmly in the hands of the media.